Bushnell Night Vision optics with built-in infrared illuminators for enhanced images in complete darkness are perfect for everything from camping, caving and observing wildlife in the darkest environments to the most demanding search and rescue and surveillance situations. 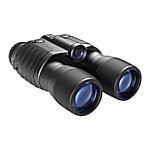 Bushnell Equinox Z Digital Night Vision Binoculars offer outstanding image clarity (due to glass objective lenses), ultimate illumination and a large field of view. Their digital technology provides color views in daytime and monochrome views after dark, along with digital zoom and image recording. 4 AA batteries yield long battery life. A durable housing with tripod mount socket completes the package. 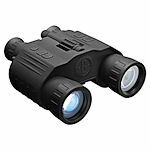 Bushnell® Night Vision optics opens a bright new world to their users. With built-in infrared illuminators for enhanced images in complete darkness, these are great for everything from camping, caving and observing wildlife in the darkest environments to the most demanding search and rescue and surveillance situations.